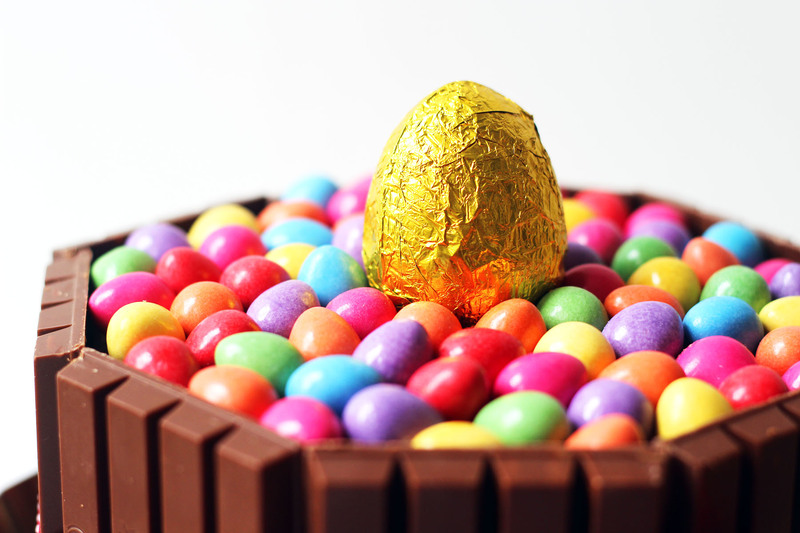 We all know that Easter is about one thing and one thing only…CHOCOLATE. Just kidding. But this epic Chocolate Easter Cake will be a real crowd pleaser this Easter weekend. I first posted this over the top Chocolate Easter Cake in 2015. My parents were hosting a big Easter lunch and I wanted to provide a show stopping cake for pudding. Putting religion to one side for a second we all know that Easter is about CHOCOLATE. So I created this epic Chocolate Easter Cake just for the occasion. This Chocolate Easter Cake is 2 layers of moist chocolate sponge covered in my classic chocolate buttercream, surrounded by chocolate bars and topped with mini Easter eggs. I also like to place a slightly larger Easter egg in the centre to turn this cake into a real centrepiece. To make the cake extra chocolate-y I not only use cocoa powder, but I also melt actual milk chocolate into the buttercream. What I love about this cake is just how easy it is to make and it doesn’t require any special or fancy ingredients. Although the decoration looks impressive it really is just a case of slathering on buttercream and sticking kit-kats to the sides. You could use chocolate fingers, chocolate cigarillos if you’re really fancy, or any other chocolate bar that takes your fancy. 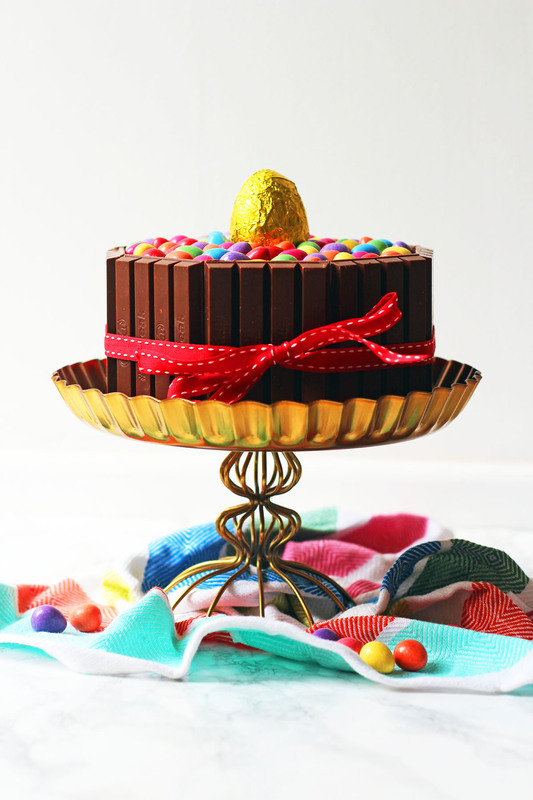 Although I’ve dressed this up as an Easter cake, simply swap the mini eggs on top for your favourite chocolates and you’ve got an over the top chocolate cake fit for any occasion! To make this cake at home just print off the instructions below. This was one of the first Easter cakes I created for the blog - its an over the top celebration of all things chocolatey! Pour the mixture into two well greased 8inch cake tins and cook for 25mins or until spring-y. Sandwich the two cakes together with a third of the icing. cover the rest of the cake with the remaining butter cream. Begin to place the kit-kat bars on their ends, around the edge of cake gently pressing them into the buttercream. Tie the ribbon around the cake to secure the kit-kats. Finish by pouring the mini eggs on to the top of the cake so that the buttercream is completely covered. Chocolate overload? Pin it for later! I know, I know. A LOT of chocolate goes into the making of this Chocolate Easter Cake but boy is it worth it. It’s had a lot of love over the last two years but if you haven’t already done so, please do make sure you pin it for later! Let’s see how many people we can reach! You may like to try the Greek Cypriot Easter cakes – Flaounes which I love. There are three cheeses in this recipe for some reason, but you will only need kefalotyri cheese (total 850 grams), I have this on good authority! Demitra Grocery at Betstyle Circus, New Southgate, should have all the specialist ingredients. That’s where we are going. Awesome thanks Joy 😀 I’ll let you know how it goes if I get a chance to make them!! That does indeed look rather spectacular Emma – I bet it got a few oohs and ahhs at work. Thanks Choclette – I am so very proud haha. It’s currently still hiding in its box! Cake sale opens in an hour. Hoping it sells for a whopper 😀 more money we can make for the charity the better. This looks delicious. I had a KitKat cake for my 30th and I loved it. Thanks Dannii! I hope it’s not going to be too difficult to cut up. I used the two-fingered kit-kats so hopefully that will act as a good marker for slicing. That looks lovely! It’s brilliant for chocoholics. Isn’t Easter a great excuse to bake, I’m making cupcakes for people in work. The Alzheimers Society is a great cause to fund-raise for I miss baking for charity sales, I’m hopefully getting involved in some very soon though. Thanks Ellie! It certainly motivates me to really bake the best I can. I knew that both cakes had to be show stoppers if we were going to raise lots of money. Last time my cake sold for £18. I’m hoping if both sell for £20 this time I can raise £40 for the charity! Fingers crossed! This is epic! 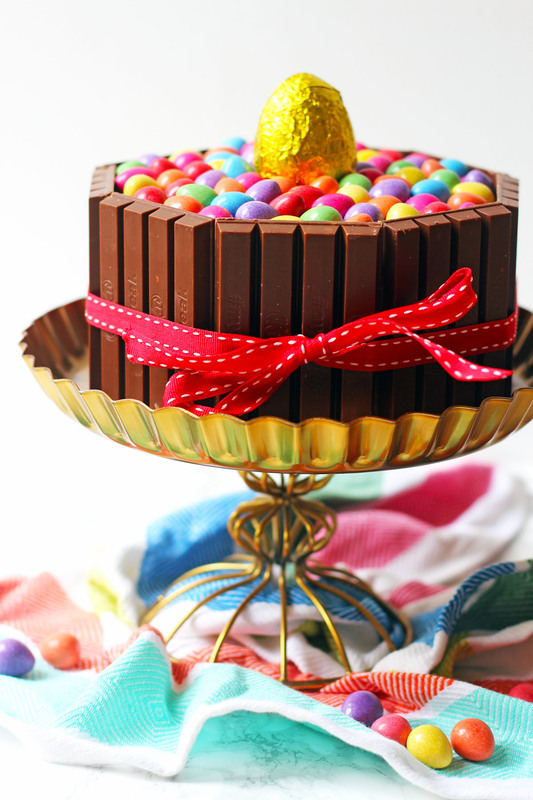 I’ve never made a kit kat cake but I need to try after seeing this! Hahaha thanks Laura! It is perfect for anyone with a chocolate addiction. You could top it with truffles, chocolate buttons, smarties, maltesers….any chocolate of your choice! Thanks for stopping by 😀 glad you like it!!! This cake looks fab, I bet my boys would love me to produce this for our Easter table! They wouldn’t know where to start! Oh boy. Years of my darling Nana’s Easter cake, depicting a nativity scene with icing you needed a drill to get through and disgraceful marzipan that made you want to hide in the cellar. Bless her heart. Yours seems like the sort of cake that people would queue round a block for. Not my thing but our daughter has just seen it and has said the words *want, now* so it’s a hit ! Hahaha thanks Anita-Clare! That was certainly the reaction I was hoping for. Your Nan’s cake sounds like a wonderful tradition. If you wanted to recreate it with better results search simnel cake on my blog 🙂 I do 11 marzipan balls on top to represent the disciples (minus Judas of course). Thanks Lia 😀 did you see the Lemon Sponge too? I hope she likes them both! Oh no I didn’t yet… I’ll check it out! She bakes, I eat… Great sisterly combination! So my kind of cake decoration – no need to be super neat on the icing, just enough to stick on the kit kat wallpaper! 😉 Looks superb, btw! Exactly Kavey! No fiddly piping so you can be as slap dash as you like :-p win win! Happy Easter! Gorgeous colour cake Emma, just right for Easter! If you make this for Easter Sunday or Monday then no need to worry about having given up chocolate for Lent either, result! Thanks Lucy! And good point! Make it on Easter weekend and not too long to wait at all! I’m giving this chocolate easter cake a go for this week end, going to combind it with my grandsons 9th birthday. Looking good so far.